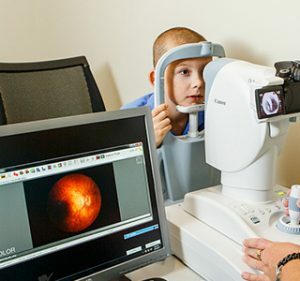 At Pediatric Eye Consultants of North Florida, we utilize new technological advances to make our office more efficient and effective. We are a paperless practice, with a cloud based electronic health records system that allows patients easy access to their records and the ability to view results, upload demographics and health record changes and communicate with office staff and physicians directly. We are equipped with wifi throughout the practice and have ipad based audio books and services for those who are visually limited or impaired. Children will feel comfortable in our waiting room, with access to video game consoles and movie centers, and nursing mothers can relax in our quiet isolation room to soothing spa music. Our exam lanes host state of the art ocular equipment, which allow us to examine and diagnose patients with precision. We carry a full line of Haag Streit slit lamps and utilize the wireless M&S acuity system featuring Google tablets and the option to “match” optotypes for non-verbal or shy children. Our new Canon AF fundus camera allows accurate diagnosis of optic nerve drusen without the need for costly MRI imaging or spinal tap. Surgeries are usually performed at Jacksonville Beach Surgical Center, a Medicare-certified and AAAHC accredited ambulatory surgical center known for its quality and clinical excellence. Ambulatory surgical centers are known for their low infection rates, on time starts, and concierge service. Studies show that ambulatory surgical centers outperform hospitals in clinical outcomes and patient satisfaction. JBSC is the only true free-standing Ambulatory Surgical center at the beach that performs over 5000 procedures each year and offers some of the most technologically advanced eye care in the area. Dr Duss, in particular, brings a number of new surgical alternatives to their pediatric armamentarium. She performs more pediatric eye and adult strabismus cases than any other surgeon on staff, bringing innovative techniques and a unique surgical skill set to the center. She is trained in intraocular cataract and glaucoma procedures, amniotic membrane grafting, endoscopic dermoid excisions as well as complex strabismus and nasolacrimal duct procedures. Surgeries may also be performed at Baptist Hospital- Beaches, Wolfson Children’s Hospital and/ or Center One Ambulatory Center. Dr Duss often coordinates care with other surgical subspecialists. She understands the risks of aesthesia in young children and will make every attempt to minimize that number of separate anesthesias required. Should your child have a co-existing ENT, ocular subspecialty or dental problem requiring surgery, cases may be combined for your convenience whenever indicated.